Researchers at the University of California, Berkeley, have demonstrated an exoskeleton that is portable and lets paraplegics walk in a relatively natural gait with minimal training. The exoskeleton uses pumps to drive hydraulic fluid to the hip and knee simulataneously, and combines “the freedom of not being tethered with a natural gait,” says Katherine Strausser, PhD candidate and one of the project’s lead researchers. The device, which houses a computer and battery pack, can run six to eight hours on one charge. The exoskeleton plans walking trajectories based on data (about limb angles, knee flexing, and toe clearance) gathered from people’s natural gaits and uses pressure sensors for proper timing. 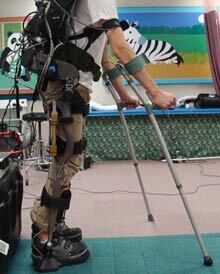 Using parts from two military exoskeletons, the device employs controllers and special design parameters to accomodate the user’s lack of strength. This could benefit people with spinal-cord injuries who spend a lot of time in wheelchairs, which can cause sores or bone deterioration.